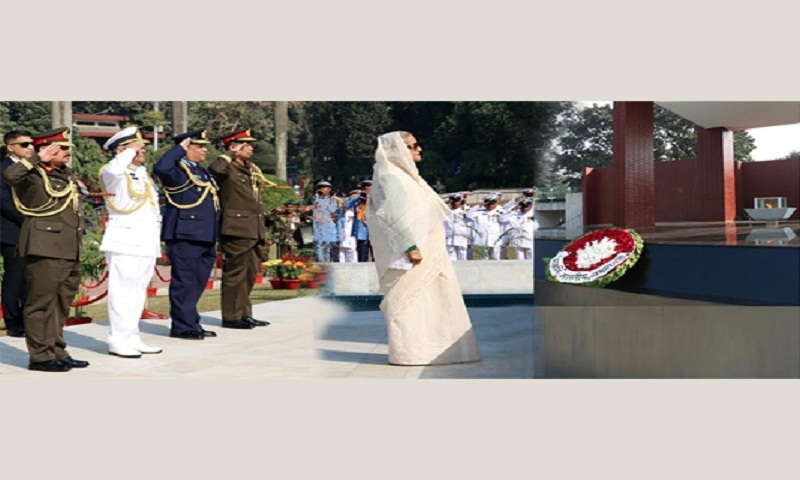 Prime Minister Sheikh Hasina today paid rich tributes to the martyred members of Bangladesh Armed Forces on the occasion of the assumption of her office as the premier for the fourth time. The prime minister paid the homage by placing a wreath at the Shikha Anirban (flame eternal) in Dhaka Cantonment this morning, reports BSS. Later, Sheikh Hasina, also in-charge of the Ministry of Defence, signed the visitors’ book kept on the premises of Shikha Anirban. Earlier on her arrival at Shikha Anirban, the premier was received by Chief of Army Staff General Aziz Ahmed, Chief of Naval Staff Admiral Nizamuddin Ahmed, Chief of Air Staff Air Chief Marshal Masihuzzaman Serniabat and Principal Staff Officer (PSO) of the Armed Forces Division (AFD) Lt Gen Md Mahfuzur Rahman. After the wreath-placing ceremony, the prime minister attended her first office at the AFD after her reelection as the premier. On her arrival at the AFD, the prime minister was received by the PSO and directors general of the AFD.